These useful, colourful, comfortable and attractive polyester chiffon beach dresses are suitable for dress-sizes 12 to 32. Great for beach holidays or Cruises. Beach kaftans and Cover-ups. Free-sized, loose-fitting. Length approx.44” N.B These items are hand.. 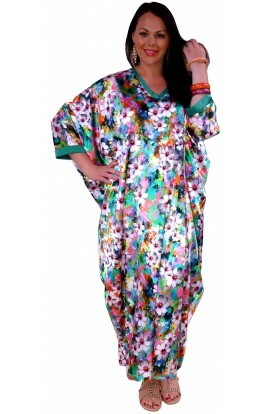 These useful, colourful, comfortable and attractive polyester chiffon beach dresses are suitable for dress-sizes 12 to 32. Great for beach holidays or Cruises. Beach kaftans and Cover-ups. Free-sized, loose-fitting. Length approx.44” N.B These items are hand screen-pr.. 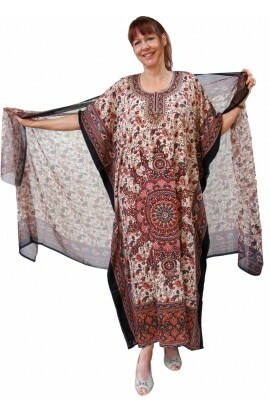 This is a kaftan top in fabulous quality cotton lawn. It has an abstract peacock design in colours deep orange, black, grey and gold. The photograph really does not do this fabric design justice. In it's real appearance, the gold that decorates the design shines like gold and the whole l.. PINK ROSE PRINT NIGHTIE. SIZE UK 22 - 28 This is made in a very soft poly/cotton jersey fabric - 52%/48% respectively. 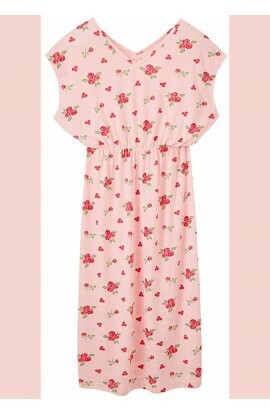 It is a very pretty and feminine nightdress in pastel pink which is decorated with roses design in a deeper shade. It features a V-neck, elasticated waist and sho..